I wanted a platform bed for my foam mattress but everything I found was too expensive, too high, the wrong size, and/or too modern in style. Ultimately, I decided to make my own bed. The bed I made is for a queen mattress, which measures 60” wide and 80” long. If you have a different size mattress, you will need to alter the measurements accordingly. 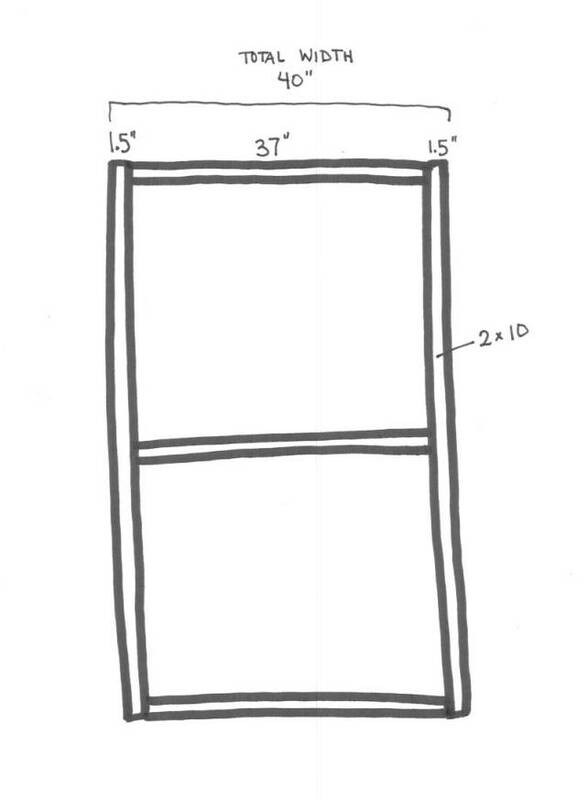 I built my bed in two pieces (60” x 40” each) so it’s not too large or heavy for me to move. Wood screws in two sizes -- The #12 x 3” shown were overkill; #10 x 3” would have been better. The #8 x 1.25” were great for attaching the OSB. Don’t have a power saw? Home improvement stores such as Home Depot and Lowe's will cut the wood for you. They're supposed to charge 25 cents per cut after the first two, but the friendly orange-aproned employees have never charged me for cutting. Why not 40” for the shorter 2x10s? When you build a box, you need to allow for the thickness of the outer sides. 2x10s are 1.5” thick and you have two sides, so that’s an extra 3”. Here is a diagram (most definitely not drawn to scale). 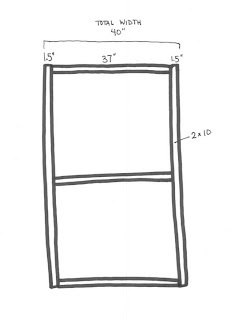 Assemble the first half of the bed using two of the 60” and three of the 37” 2x10s. Pre-drill the holes, two per end (about .75” from the end of the board) and two in the middle of the 60” boards. Drive in the larger wood screws. Use the level and square as needed to ensure your bed isn’t (too) crooked. Optional: Cut a notch for wires. I have an electric blanket, and the wires need to run to the foot of the bed. I used a jigsaw to cut a notch for the wires to run through. Place the OSB on top and attach it using the smaller screws. I didn’t want to chance any scratches to my brand-new floor, so I attached peel-and-stick felt strips to the bottom of the bed. Because OSB is rough, cover it with fabric before putting on the mattress. A bedskirt will do the trick, or use an old sheet. Your bed is made! VERY nicely done. You really thought of everything on this one, with the cord notch and the felt pads. I love how your blog covers both simple DIY techniques(hot glue and spray paint) as well as more complex projects. VictorianKitty - Thank you! I was concerned that the variety of projects might be coming across as too erratic. I love this! My cheap platform bed falls apart more and more with each move, and I've been wondering if I could just build a new one. Thanks! My bed is certainly sturdy. It's quite heavy, but actually not too hard to move. You can stand each section up and then carry it vertically, so it's not hard to get through doorways and such.